B. P.I.-404. li I d October 3, I14 . 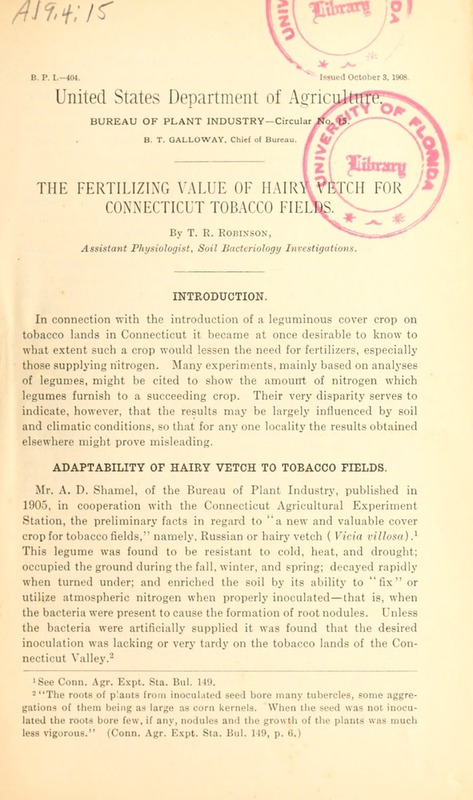 B. T. GALLOWAY, Chief of Bureau "
ADAPTABILITY OF HAIRY VETCH TO TOBACCO FIELDS. '.,_ Conn. Agr. Expt. S Ma. Bul. 119. FERTILIZING VALUE OF HAIRY VETCH. IMPORTANCE OF INOCULATING HAIRY VETCH. inoculated and uninoculated vetch this will be easily understood. gen in samples of the soil were made by the Bureau of Chemistry. was dotted white with the glistening nodules. POT EXPERIMENTS WITH HAIRY VETCH. culture of the vetch-nodule ir_:1imn. the remainder being untreated. The pots were watered throughout with water sterilized by boiling. FERT'ILAMINg VAIX' OF \IuiHY VI;TCI. :ilttr three months' _,i-mth (D)ecember 11, 1907, to March 19, lVM)S). 'Twopts t he 1 i i Wtley (ipct'il oriihto Dry y i eifriht. Nitr( g n f' -. place te t h i;.se -t results both as to yield and p, tI, td ,i of niti . cets of the 1 '2fi1,., wVere superior to rye in furt isl,;t nitri gen.
of ur at 140e C., part of them I ih, planted with inoculated vetch seed. while the inoculated Ilants were healthy in color. NITROGEN FURNISHED BY HAIRY VETCH TURNED UNDER. be seen what 'n enormous ..iin was effected by abli ldant inorulation. Ie ..... ... ...... 1t.7 *". *I1 l .i >l' . be its ability to secure nitrogen from the soil. assumed that this becomes at once available for the succeeding crop. pounds of nitrate of soda (15 per cent nitrogen). of 200 pounds to the acre three days before setting out the tobacco plants. and 500 pounds of sodium nitrate to the acre. Hairy vetch turned under ...... No fertiize .......... 5..
R(ve turned lender F I .I . .. 2. N j,", of four pots. tire than the use of 200 pounds to the acre.